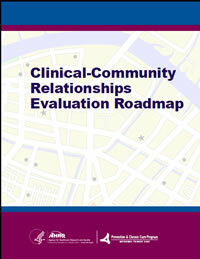 The Clinical-Community Relationships Evaluation Roadmap is a resource for future research and evaluation of effective clinical-community resource relationships. The Roadmap will be of use to funders, researchers, and program evaluators interested in primary care. The resource's investigators pose priority questions and recommendations for advancing research and developing clinical-community resource measures, based on an environmental scan of measures, a targeted literature review of research, an assessment of evidence gaps, and input from an expert panel. While the Roadmap specifically addresses clinical-community resource relationships for selected clinical preventive services, the principles and questions offered may also apply to other clinical and non-clinical services. Thus, the Roadmap also may prove applicable to those interested in effective relationships and coordination between clinics and community organizations such as schools or providers of social services. 2.1.1 How do the Characteristics of Primary Care Clinicians and Clinics, Patients, and Community Resources Influence the Effectiveness of Linkages for the Delivery of Clinical Preventive Services? 2.1.2 How do Characteristics of the Clinician-Patient Relationship, the Patient-Community Resource Relationship, and the Clinical-Community Resource Relationship Influence the Effectiveness of Linkages for the Delivery of Clinical Preventive Services? 2.1.3 How Does the Relative Importance and Influence of Clinics and Clinicians, Patients, and Community Resources, and their Mutual Interrelationships, Vary in Different Circumstances Or Contexts, Including the Delivery of Different Clinical Preventive Services? 2.1.4 What are the Best Methods, Strategies and Settings for Studying and Improving Clinical-Community Resource Relationships for the Delivery of Clinical Preventive Services? 2.1.5 What are the Best Measures for Evaluating the Effectiveness of Clinical- Community Resource Relationships for the Delivery of Clinical Preventive Services? This document is in the public domain and may be used and reprinted with permission except those copyrighted materials that are clearly noted in the document. Further reproduction of those copyrighted materials is prohibited without the specific permission of copyright holders. None of the investigators has any affiliations or financial involvement that conflicts with the material presented in this report. The findings and conclusions in this document are those of the authors, who are responsible for its contents; the findings and the conclusions do not necessarily represent the views of AHRQ. No statement in this article should be construed as an official position of the Agency for Healthcare Research and Quality or of the U.S. Department of Health and Human Services.